File photo of the Sibir. Special Containment Procedures: Containment efforts regarding SCP-2675 are suspended: the anomaly is to be destroyed on sight. Engagement of SCP-2675 is optimally conducted by aircraft, as the anomaly has proven both elusive and advantaged against naval units. Neutralization procedures are to be focused on complete thermal destruction of the vessel. Reports of maritime disasters and unusual incidents are to be monitored, with primary attention directed at the Arctic, northern Atlantic, and northern Pacific Oceans (see Reconnaissance File-2675 for details and areas of special attention). Satellite observation of the aforementioned areas will be maintained continuously. Civilian or military contact with SCP-2675 requires immediate implementation of Grade-IV media blackout protocols, and the deployment of an aerial response team from the nearest practicable facility. General Pyotr Vinogradov (Security 4/2675) will direct the assembly and operations of the aerial response team. Non-Foundation survivors recovered from SCP-2675 events will be administered Class-A amnestics. Description: SCP-2675 is the Sibir, an Arktika-Class nuclear-powered icebreaker constructed by the Soviet Union in 1977. 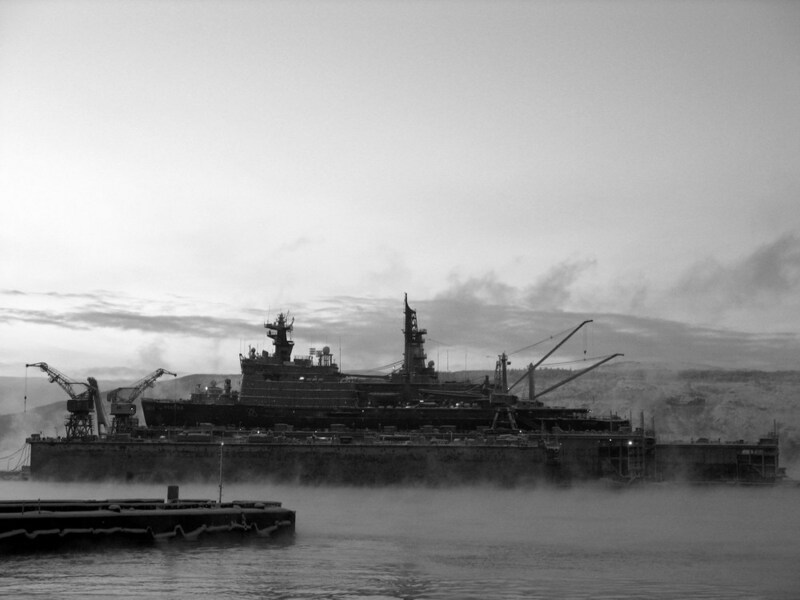 Official records from the Russian Federation indicated that the Sibir was retired in 1992 due to a steam system malfunction, however, documents turned over by the GRU-P reveal that the Sibir was lost during a mission in the Arctic Ocean investigating a believed anomalous artifact. Although SCP-2675's current appearance is not significantly different than it was prior to its 1992 disappearance, the vessel may spontaneously change shape and produce additional structures, equipment, or weaponry. SCP-2675 generates varying levels of neutron radiation, and is frequently observed to produce a pale blue glow in surrounding waters, believed to be Cherenkov radiation. In addition to traveling in a mundane manner, the vessel also possesses a second form of transportation. This second method consists of SCP-2675 wholly vanishing from one location and manifesting elsewhere; the nature and limitations of this ability are unknown, though it does not appear to detriment SCP-2675 and coincides with a momentary increase in neutron radiation from the vessel. SCP-2675 is sporadically encountered by military and civilian naval vessels in waters of the Arctic, northern Atlantic and northern Pacific Oceans, occasionally being spotted as far as south as the Sea of Okhotsk, the Gulf of Alaska, and the North Sea. SCP-2675 is hostile and extremely dangerous, though its aggression seems secondary to a primary objective, the nature of which remains speculative. No crew or other personnel have ever been observed on or inside SCP-2675, however, previous encounters with the anomaly have determined the existence of a discrete entity now designated SCP-2675-1. SCP-2675-1 is believed to be the vessel's captain or controller, and while the entity has not been visually identified, it has communicated with civilian, military, and Foundation personnel via radio. SCP-2675-1's voice is consistent with an adult human male, and the entity is fluent in Russian, French, and English. SCP-2675-1 is both hostile and highly intelligent, making use of SCP-2675's stoutness and anomalous properties to compensate for its lack of military configuration. On November 7, 1995, SCP-2675 was observed by numerous civilian sources in the Bering Sea. The nuclear icebreaker's presence was not immediately thought to be unusual, given its close proximity to Russian shores and arctic waters. Eight hours following initial observations, SCP-2675 made contact with an American commercial vessel and engaged with extreme prejudice. Reports intercepted by Foundation personnel in Anchorage, Alaska describe numerous anomalous properties exhibited by the icebreaker; these reports were redirected immediately to the Regional Superintendent's office in [REDACTED]. Upon order from the Regional Superintendent, Foundation contacts at Naval Base Kitsap in Washington state deployed the Altman, an Arleigh Burke-class destroyer, to the Bering Sea. Notes: The Altman maintained radio contact with Foundation contacts at Naval Base Kitsap throughout the mission, which, coupled with recovered video/audio recordings, have allowed for a largely reliable record of the event. Altman: Unknown contact, identify immediately or be destroyed. Altman: Unknown contact, this is your final warning, identify or be destroyed. SCP-2675-1: Ah, Americans. You want to know who am I? I am herald of god. SCP-2675-1: I sail for the god child, born of the atom. My flesh burns with the light of his knowledge. I am no longer life but time and energy. Is that answer enough for you? Altman: That is indeterminate. You are responsible for numerous civilian casualties and must be detained. Allow yourself to be escorted into our custody or be destroyed. SCP-2675-1: The god child does not desire this, and neither do I. I alone am master of this ship, and only god can direct me. Altman: Surrender yourself or be destroyed; there will be no further communication. SCP-2675 transfigures, producing two large devices resembling microwave emitters on its starboard deck. The Altman fires an RGM-109B Tomahawk missile at SCP-2675, however, the target vanishes prior to contact. Missile detonates underwater. SCP-2675 manifests at point-blank range to the Altman, ramming it on the latter's port side. The Altman suffers significant damage, but opens fire on SCP-2675 with its Mark 45 artillery and M242 Bushmaster cannons. While under fire, SCP-2675 directs both of the aforementioned devices at the Altman. Crew aboard the Altman report the spontaneous appearance of many transparent and luminous humanoid figures, which, as determined by on-board dosimeters, all produce lethal levels of ionizing radiation. At this point, SCP-2675 has sustained grievous damage from the bombardment, and breaks away, heading north. The Altman continues its assault until SCP-2675 vanishes again. In the aftermath of Event 2675-Alpha, two Sikorsky CH-53E Super Stallion helicopters were deployed to determine the status of the Altman and search for survivors. It was determined that all personnel aboard the Altman were killed, either by SCP-2675's collision, drowning, or radiation poisoning. Analysis of recovered video footage indicates that personnel suffering radiation poisoning from contact with SCP-2675 displayed atypical symptomatology, including transparency and luminosity of organic tissues, and emission of Cherenkov radiation from the eyes (due to interaction between charged particles and the vitreous humor). At the time of its next recorded appearance, the damages sustained by SCP-2675 during Event 2675-Alpha were seemingly repaired, and noticeable changes were observed in the vessel's structure. In May of 1996, several former GRU-P operatives were granted asylum in return for the relinquishment of numerous documents, including those pertaining to the Sibir's service history. Records indicate that the icebreaker was utilized by the GRU-P for reconnaissance and transportation of materials between installations in northern Russia. The vessel's last recorded mission, in 1992, entailed the investigation of an electromagnetic anomaly in the Arctic Ocean. Contact with the Sibir was lost four days into its mission, following a final radio transmission from the captain, [REDACTED], the nature of which was undetermined at the time. Below is a translated transcript of [REDACTED]'s transmission. I have placed the child in his cradle. It is a crude cradle, small and weak, but it is all that my ship could give him. The truth is that we were not looking for him. He was looking for us. He found us, looking through his frozen cocoon; we looked at him but did not know or comprehend. I broke open his cocoon and held him in my hands. I burned but did not feel pain. My men and I were reduced to ash in the snow. Without eyes we could truly see. Without flesh we could truly feel. I felt the love of god. I saw the light of his majesty. In this nuclear age we can think only of missiles and power plants, but there is something purer inside all of us. We are atoms. The god child sits in the heart of my ship, and he will take us on a long journey. When I return, I will show all men his love, and I will find the other children that sleep in the sea. You are unworthy! You cannot have them! Surrender your cradle to me! SCP-2675 was not observed again until eight months following this event; it showed no signs of damage, but demonstrated a significant increase in neutron radiation emission. The anomalous aircraft has not reappeared, in conjunction with SCP-2675 or otherwise. During his interrogation, the sailing vessel owner turned over several photographs he had obtained of the event, which included some images of the aircraft. 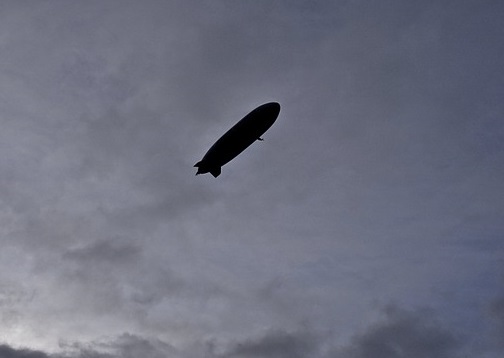 After investigation, it was determined that the aircraft's dimensions and markings were consistent with that of the [REDACTED], a zeppelin developed by Nazi Germany in 1943 as part of an experimental nuclear weapons program. The [REDACTED] is known to have been carrying or integrated with an anomalous object unidentified in available records.